Giant funny swirling glow-in-the-dark wiggle googly eyes. Choose from 4 available classic and crazy shapes to bring any inanimate object to life, for loads of creepy Halloween party fun or funny gag any time. 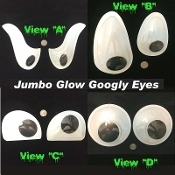 Choose ONE PAIR of Giant Glow-in-the-Dark Plastic Googly Eyes among the 4 shapes available. Each package includes 2-pieces per set.